Well I have been so busy and way behind with posting gym pictures. If you have been following our website our product range has been growing rapidly, along with our sales, so I have been focused on getting stuff out the door. Plus this gym is one that I didn't want to rush.This is a perfectly laid o..
Big thanks to Hendo for sending in a pic of his home gym.Now Hendo's Powertec Multi System is old! But as we say Powertec gyms don't grow old, their owners just wear out! 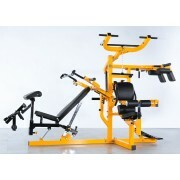 As you can see Hendo's is still in excellent condition along with his white stand Ironmaster Quick Lock Dumbbells. These are very..
Big thanks to Mick for sending in a pic of his Megatec Multiplex Home Gym set up with a nice twist....This one will get the Power Rack brigade's noses out of joint as it is a classic bodybuilding style set up. 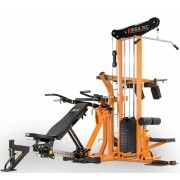 There isn't a better gym around for getting your pump on than the Megatec Multiplex Gym. 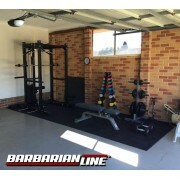 A..
Big thanks to Kyle for sending in a pic of his Barbarian Smith Machine Gym. 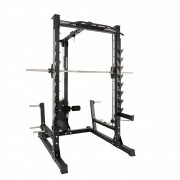 This is a great all round gym that offers more than meets the eye...The Barbarian Smith Machine Gym System is an old school Smith & Half Rack combo. As a smith machine is quite simply a beast. 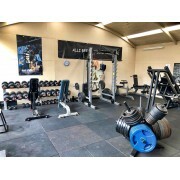 It's stability even without..
Big thanks to Simon from Ox Fit in Yackandandah for sending a new pic of his gym. Simon does Personal Training, and this is exactly the sort of gym I would like to go to. There is no fancy machines, just iron and steel. You know you will be in for a tough workout!This is what Simon had to say about ..
Big thanks to Matt for sending a pic of his Barbarian Power Cage Gym. Matt has stepped up big time with this set up, going straight for the top shelf with the Barbarian Cage System. Like a lot of blokes that visit the showroom, he was blown away by the physical presence of the Barbarian cage - .. Thanks to Alex for sending in a pic of his new Megatec Power Rack Gym. Alex was tight on space so opted for the 185cm Power Rack Barbell. This reduces the width required quite significantly in a small room. Morn Sam,Got it assemebled on the weekend and had the first workout yesterday. Couldn't.. This is a great story, and one I have been meaning to post for ages. Tony came into my shop as a young bloke years ago. I am talking probably over 10 years! 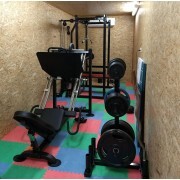 The Powertec gym equipment must have made quite an impression because when the opportunity presented itself, Tony set himself his dream home gy..
Firstly, I am way behind with updates to our cool home gym section, so if you have got photos that you want to send in, please do. I am going to try and roll through a few gyms in the next couple of weeks. Colin's story is great. These days I don't do a lot of sales as the business has grown an..